In Label, enter a title for the Address field, e.g., Billing Address. In Type, Address should appear. To require a complete address for each record, select Required. In the Format dropdown, select whether the Address field is restricted to United States or International. If you have selected United States, the option below it will become the States selection menu. You can select specific states to restrict the states that may be entered. All states are available by default. You can restore to the default by clicking Reset States. If you have selected International, the option below it will become the Countries selection menu. Here, you can enter the countries to which you wish to restrict your addresses. The field is initialized with over 200 countries. To return to this default set, click Reset Countries. You can change the width of the input boxes. The default setting, 60 pixels, is optimized to allow a map to appear next to the field, but this can, of course, be changed to suit your needs. The width of the Postal Code subfield is always 50% the width you designate. The width of the Country listbox is fixed and will not be affected if you change the width of the other subfields. 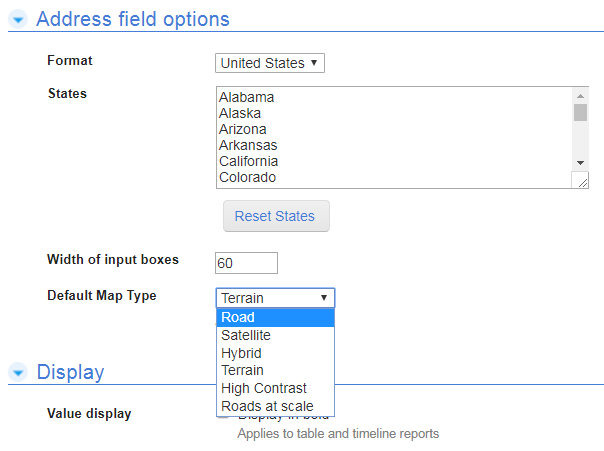 You can also select the default map type to display on forms. Restrict access to the field by role. Auto-fill the value of the field when you copy the record to add a new record. Include the contents of the field when searching or filtering the table. Determine whether the field may be used in reports, including all new reports. Enter field-level help text that’s displayed when users click the i ( ) icon next to the field. To save your changes, click Save in the Page bar.